He Tohu is a remarkable new permanent exhibition in the National Library of New Zealand Te Puna Mātauranga o Aotearoa in Wellington, that opened on 20 May 2017. It sheds new light on three iconic constitutional documents that shape our nation: 1835 He Whakaputanga o te Rangatiratanga o Nu Tireni - Declaration of Independence of the United Tribes of New Zealand, 1840 Te Tiriti o Waitangi - Treaty of Waitangi and the 1893 Women’s Suffrage Petition - Te Petihana Whakamana Pōti Wahine. Matariki - Maori New Year. See our index New Zealand Maori. A set of stamps and a first-day cover celebrating the exhibition will be available from 17 May. The issue consists of three stamps - one for each of the documents. Two stamps feature a historic and modern figure - reflecting the relevance of the documents both at the time they were signed and today. The third stamp, Te Tiriti o Waitangi – Treaty of Waitangi, reflects partnership. 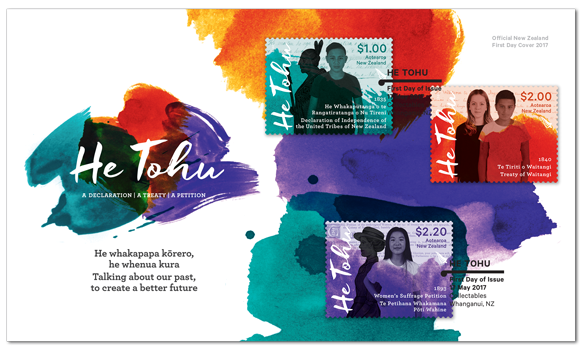 The colours and style of the stamps echo the He Tohu exhibition. $1.00 - 1835 He Whakaputanga o te Rangatiratanga o Nu Tireni. 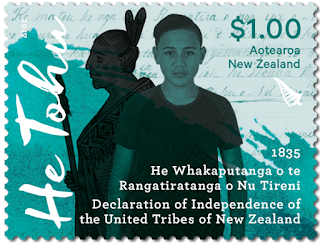 Declaration of Independence of the United Tribes of New Zealand - The figure behind the young person in the foreground is a stylised rangatira representing the signatories to the declaration. He is holding a taiaha, signifying strength and willingness to defend independence. Pacific blue represents the ocean, especially in the north of New Zealand where the document was signed. $2.00 – 1840 Te Tiriti o Waitangi – Treaty of Waitangi. 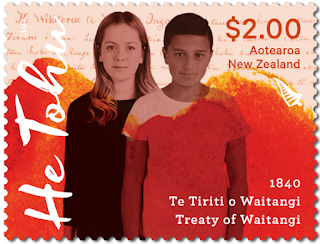 The young boy and girl are facing the future of Aotearoa New Zealand together in partnership, in the spirit of Te Tiriti o Waitangi – Treaty of Waitangi. The ochre colour is associated with the Māori tradition that the first woman was formed from the red earth. Kaka wing feathers are a similar vivid orange and are associated with chiefly status. $2.20 - 1893 Women’s Suffrage Petition - Te Petihana Whakamana Pōti Wahine. NZ Suffrage on Stamps - A Thematic Collection. 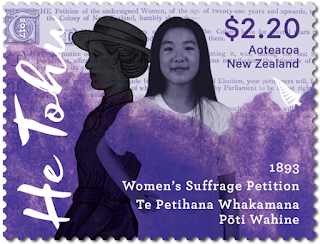 The figure in the background of the Women’s Suffrage Petition stamp is a stylised “suffragist” from the 1890s, representing the hundreds of volunteers who door-knocked in all weathers in communities across the country to collect the signatures that won New Zealand women the vote. Purple was the official colour of the movement. Date of issue: 17 May 2017. Number of stamps: Three gummed stamps. 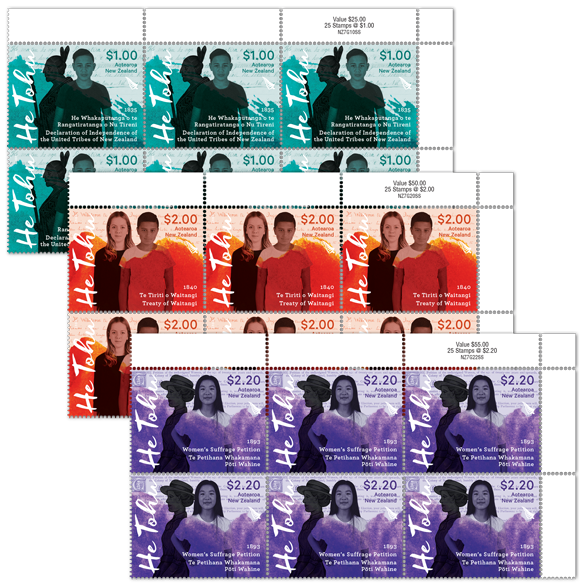 Denominations: $1.00, $2.00 and $2.20. 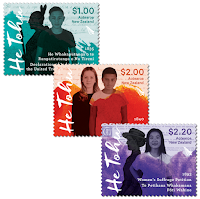 Stamps and first-day cover designed by: Spencer Levine, Story Inc, Wellington, New Zealand. Printer and process: Southern Colour Print Ltd, New Zealand by offset lithography. The number of colours: Four process colours with Synseal Overgloss. Stamp size and format: 46mm x 35mm (horizontal). Paper Type: Tullis Russell 104 gsm red phosphor gummed stamp paper. Perforation gauge: 14.286 x 14.47. Period of sale: These stamps remained on sale until 16 May 2018. 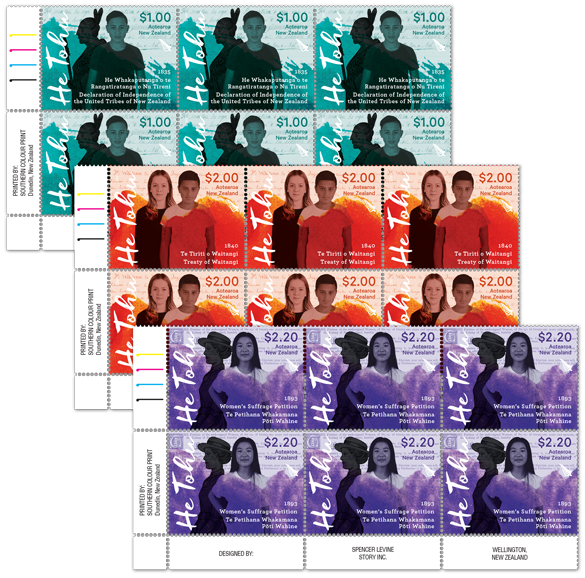 First Day Covers remained on sale until 16 July 2017.